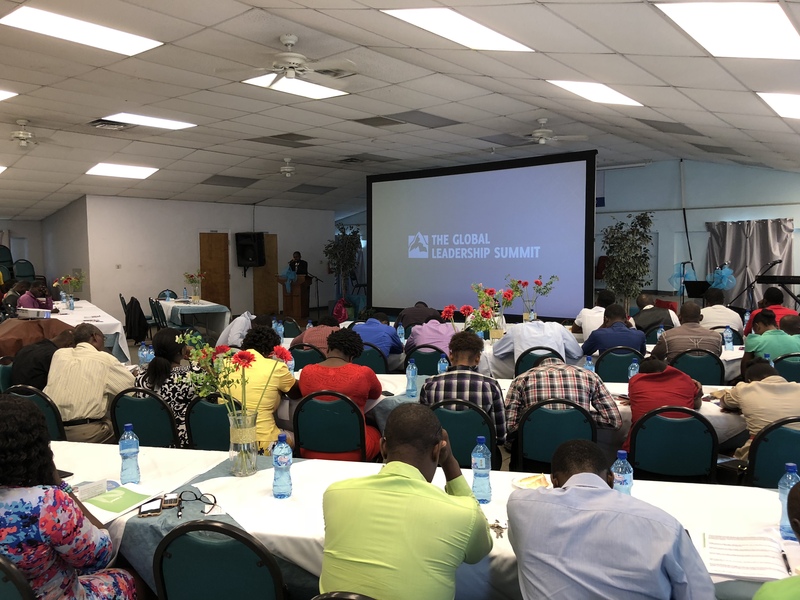 Here I sit the morning of Day 2 of our Global Leadership Summit in awe of how God is using this Summit for the leaders of Grace En Sion and this region. Hearts and leadership buckets are being filled. Beautiful souls and minds are being stirred. You could tell they were excited yet nervous as the first session began, not knowing what to expect. As the day progressed, laughter, “mmhmm’s,” “Amen’s,” and “wow’s” filled the air as they watched speakers from all over the world tell stories that challenged almost every area of the soul, heart and mind. Worship was sweet and special videos were challenging to the mind. 9 months ago, we were contacted by the Willowcreek Association in hopes we could try a Global Leadership Summit in Cap Haitien. The GLS is something that we are very familiar with at Grace. But presenting it in a foreign country and doing it in French? Now that would be another story! Reflecting on how I feel about what has happened so far, many feelings flood my heart. I am excited. Proud. Grateful for a team that stepped up to try something that we have not done yet in Haiti. The Grace Team has knocked it out of the park! I also have to give a special thanks to our incredible tech, Ethan, who helped produce the event. I am also incredibly impressed with the passion and boldness Pastors Migueloson and James have displayed in their leadership over these last two days, willing to try something unfamiliar to them. I was reminded yesterday how incredibly blessed we are with the partnership with Grace En Sion and these 2 pastors. This relationship is beyond ordinary and clearly orchestrated by God. You really cannot put words to it. I hear many people down here also speak of it’s uniqueness and how blessed both churches are. I am blessed beyond the church though. I am truly blessed with relationships. Relationships with two Godly leaders and a welcoming reception of love each time we are here as two churches tightly connected with the same vision. A vision that calls us to develop followers of Christ to impact the region/world with the redeeming power of the cross. I was reminded of Miggy’s humble confidence that God will show up at the conference to impact the leaders present. I watched James roam that room of leaders with an attentive eye and proud posture to greet and serve, keenly aware this event would impact each person in a special and unique way. Thanking God for pushing our comfort zone more and more each year. What started as a partnership so many years ago has developed into something so much more special today!